Prior evidence suggests that the renin angiotensin system and antihypertensives that inhibit this system play a role in cognitive, central vascular, and endothelial function. Our objective is to conduct a double-blind randomized controlled clinical trial, the antihypertensives and vascular, endothelial, and cognitive function (AVEC), to compare 1 year treatment of 3 antihypertensives (lisinopril, candesartan, or hydrochlorothiazide) in their effect on memory and executive function, cerebral blood flow, and central endothelial function of seniors with hypertension and early objective evidence of executive or memory impairments. The overall experimental design of the AVEC trial is a 3-arm double blind randomized controlled clinical trial. A total of 100 community eligible individuals (60 years or older) with hypertension and early cognitive impairment are being recruited from the greater Boston area and randomized to lisinopril, candesartan, or hydrochlorothiazide ("active control") for 12 months. The goal of the intervention is to achieve blood pressure control defined as SBP < 140 mm Hg and DBP < 90 mm Hg. Additional antihypertensives are added to achieve this goal if needed. Eligible participants are those with hypertension, defined as a blood pressure 140/90 mm Hg or greater, early cognitive impairment without dementia defined (10 or less out of 15 on the executive clock draw test or 1 standard deviation below the mean on the immediate memory subtest of the repeatable battery for the assessment of neuropsychological status and Mini-Mental-Status-exam >20 and without clinical diagnosis of dementia or Alzheimer's disease). Individuals who are currently receiving antihypertensives are eligible to participate if the participants and the primary care providers are willing to taper their antihypertensives. Participants undergo cognitive assessment, measurements of cerebral blood flow using Transcranial Doppler, and central endothelial function by measuring changes in cerebral blood flow in response to changes in end tidal carbon dioxide at baseline (off antihypertensives), 6, and 12 months. Our outcomes are change in cognitive function score (executive and memory), cerebral blood flow, and carbon dioxide cerebral vasoreactivity. The AVEC trial is the first study to explore impact of antihypertensives in those who are showing early evidence of cognitive difficulties that did not reach the threshold of dementia. Success of this trial will offer new therapeutic application of antihypertensives that inhibit the renin angiotensin system and new insights in the role of this system in aging. In addition to its role in developing cardiovascular disease and stroke, hypertension is also a risk factor for cognitive impairment [1–5] Although blood pressure tends to decline around the time of onset of clinical cognitive impairment, hypertension leads to accelerated decline in those with cognitive impairment or dementia[6, 7] Of all the cognitive domains, executive function is more vulnerable to the effects of hypertension [8–10] Executive function is defined as the set of cognitive skills that are responsible for the planning, initiation, sequencing, and monitoring of complex goal-directed behavior Seniors suffering from executive dysfunction have significant impairment in following medical advise  and are more likely to develop disability[13, 14] It is estimated that close to 30% of the elderly population have executive function abnormalities and are generally undetected[15, 16] No prior research has evaluated the effect of hypertension treatment on executive function or specifically enrolled those with executive dysfunction. The process by which hypertension can affect cognitive and executive function is not clear. It is likely to be, in part, related to the cerebral blood flow (CBF) regulatory system. This is supported by the evidence that lower CBF measured by Transcranial Doppler (TCD) is associated with progressive decline in cognitive function For example, in patients with amnestic mild cognitive impairment, lower CBF was associated with a higher risk for converting to dementia Further, abnormal cerebrovascular reactivity was associated with worsening cognitive decline in patients with Alzheimer's disease Hypertension is associated with a decrease in CBF over and above any effect of age [20–23] Hypertension also impairs neurovascular coupling and vasoreactivity to CO2, a measure of brain endothelial function Taken together, this provides a rational for investigating the role of CBF regulation in the relation between hypertension and cognitive function. From a neuro-humoral standpoint, multiple systems may be involved in the relation between hypertension and cognitive function. However, a paucity of evidence point to the renin angiotensin system (RAS). Anatomically, angiotensin II (Ang II) and its receptors are located in neurons inside the blood brain barrier and in the cerebrovascular endothelial cells and circumventricular organs Functionally, Ang II has been linked with cognitive function in animal models In addition, Ang II also decreases cerebral blood flow and impairs neurovascular coupling in hypertensive patients. Ang II impairs endothelial function, which has been linked to poor cognitive function and early Alzheimer's disease [30–33] The role of the endothelium in cognitive function, aging and hypertension has gained much attention recently [33–38] Central endothelial function can be assessed indirectly by the response of CBF to changes in end-tidal CO2 Ang II plays a critical pathophysiological role in impairing endothelial function, especially in those with hypertension[30–32, 40] Therefore we are suggesting that hypertension is associated with RAS activation and endothelial function impairment that in turn are associated with abnormal CBF regulation and cognitive and executive function impairments. Multiple observational and experimental studies, although not universally consistent, have shown that use of antihypertensives may provide cognitive protection in the elderly population However, it is not known if they provide this effect solely by lowering blood pressure or via an additional class specific effect Based on our suggested pathway from hypertension to cognitive impairment, we are hypothesizing that antihypertensives that inhibit the activity of RAS lower this risk beyond just lowering blood pressure. They also restore endothelial function and cerebral blood flow regulation leading to further cognitive protection. Drugs that inhibit RAS include angiotensin converting enzyme inhibitors (ACEI) and angiotensin receptor blockers (ARB). ACEI block ACE and decrease Ang II production, whereas ARB block the angiotensin receptor type 1 but not type 2[43, 44] ACEI and ARB may be protective against cognitive and physical impairment in hypertensives [45–50] In an observational study of 1,220 Italian individuals with heart failure, treatment with ACEI was associated with improved cognitive performance The Perindopril Protection Against Recurrent Stroke Study indicated that perindopril (ACEI) reduced the risk of incident cognitive impairment in those with a previous history of stroke In the Cognition and Prognosis in the Elderly trial, treatment with candesartan (ARB) was associated with a lower rate of cognitive decline only in those with Mini-Mental Status-Examination Scores between 24 and 28 compared to placebo, but not the whole sample Other antihypertensives such as diuretics and calcium channel blockers may increase RAS activity through increasing renin levels[53, 54] Diuretics, which produce similar lowering blood pressure effect to ACEI and ARB, activate RAS. Studies suggest that diuretics do not demonstrate a cognitive protective effect . Of the two classes, recent studies have shown that ARB may be superior to ACEI or diuretics in providing neuro-protection and improving vascular function[45, 64, 68] Both type 1 and 2 angiotensin receptors are present in the brain and have opposing effects: type-1 leads to vasoconstriction, whereas type 2 receptor leads to vasodilatation, neuronal differentiation, apoptosis and axonal regeneration ARB, but not ACEI inhibit the type-1 receptors leaving the type-2 receptors active. This may translate to greater cerebral dilatation and a superior protective effect. In fact, preliminary evidence suggests that ARB are superior to other antihypertensives in their ability to reduce the risk of stroke They also provide greater anti-atherosclerotic effect; measured by intima-media thickness, compared to ACEI in elderly hypertensive individuals Therefore, we hypothesize that ARB are superior to ACEI in their cognitive and endothelial function effect measured by TCD at the middle cerebral artery, which in turn is superior to HCTZ, a drug that activates RAS. Our objective is to conduct a double-blind randomized controlled clinical trial, the antihypertensives and vascular, endothelial, and cognitive function (AVEC), to compare 1 year treatment of 3 antihypertensives (lisinopril, candesartan, or hydrochlorothiazide (HCTZ)) in their effect on memory and executive function, cerebral blood flow, and central endothelial function of seniors with hypertension and early objective evidence of executive or memory decline. The overall experimental design of the AVEC trial is a 3-arm double blind randomized controlled clinical trial. A total of 100 community eligible individuals with hypertension and early cognitive impairment are being recruited from the greater Boston area. Evaluated at the cardiovascular research laboratory at the Institute for Aging Research, and then randomized to candesartan, lisinopril, or HCTZ ("active control") for 12 months. Currently recruitment efforts include various community activities, faith-based community events, health fairs, advertisements, and mail out announcements. Figure 1 describes the flow from screening to study exit. The Institutional Review Board at the Institute for Aging Research at Hebrew Rehabilitation Center for Aged approved the study and all participants provide written informed consent. Study flow of the AVEC trial from the screening tothe study exit. (1) Intolerance to 2 of the study medications; (2) SBP >200/DBP >110 mm Hg if not on treatment or SBP > 180/DBP > 100 mm Hg if on antihypertensive therapy; (3) Mini-Mental-Status-exam (MMSE)<20 or a clinical diagnosis of dementia or Alzheimer's disease; (4) elevated serum creatinine or serum potassium at baseline; (5) receiving >2 antihypertensives; (6) Comorbid illnesses (congestive heart failure, diabetes mellitus stroke); and (7) inability to perform the study procedures. Individuals who are currently receiving 1 or 2 antihypertensives are eligible to participate if the participant and the primary care provider are willing to taper their antihypertensives. The medication is tapered while carefully monitoring blood pressure using a standard protocol in our laboratory . The intervention is treatment with lisinopril, candesartan, or HCTZ. The goal of the intervention is to achieve blood pressure control defined as SBP < 140 mm Hg and DBP < 90 mm Hg. The starting dose is 10 mg increased to 20 mg then 40 mg of lisinopril; 8 mg increased to 16 mg then 32 mg of candesartan; and 12.5 mg increased to 25 mg of HCTZ. Titration occurs every 2 weeks until blood pressure is <140/90 mm Hg. If blood pressure is still not controlled, long acting nifedipine is added at 30 mg increased to 60 mg and 90 mg in 2 week increments. If still not controlled, a beta-blocker is added at 12.5 mg increased to 25 mg and 50 mg of long-acting metoprolol. The randomization is performed using computer generated random numbers leading to a random allocation sequence. This random allocation is performed at the central pharmacy at Hebrew SeniorLife. Both study personnel and participants are blinded to the group assignment. (i) Screen: This includes: (1) informed consent, (2) 2 seated blood pressure measurements separated by 5 minutes, (3) executive function and memory assessments, and (4) inclusion/exclusion criteria assessment. Eligible participants are scheduled for the Baseline visit. If they are receiving antihypertensives, they are also given the automated blood pressure measurement machine. Instructions on using the machine, tapering the antihypertensives, frequency of measurements, a diary, and appropriate phone numbers are provided. (ii) Baseline evaluation and randomization: during this visit, participants undergo blood pressure measurements, cognitive assessments, physical measures, and TCD procedures. 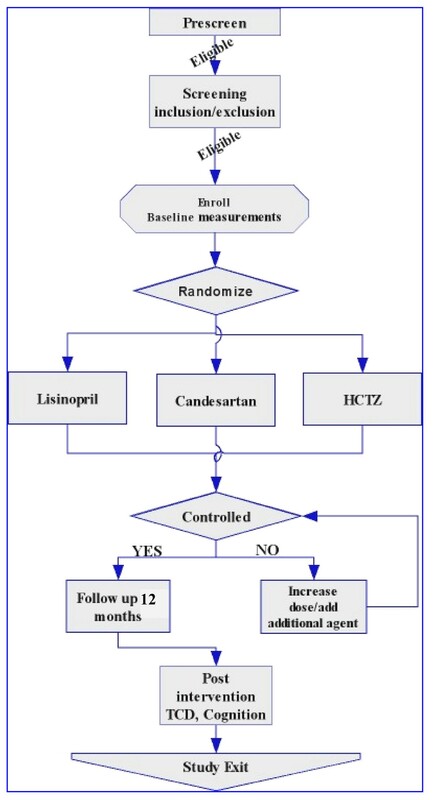 Randomization to one of the 3 antihypertensive medications occurs after the baseline visit. (iii) Follow up: Participants are then seen every 2 weeks until blood pressure control (<140/90 mm Hg) is achieved. During these visits, blood pressure measurements, medication adjustments and assessments of potential adverse events are completed. Participants are then followed for 12 months after achieving target blood pressure (<140/90 mm Hg) and evaluated at 1, 3, 6, and 12 months. At each evaluation, blood pressure, adverse events, pill count (to assess compliance), use of other medications is assessed, and blood samples are drawn as outlined in Table 1. A re-evaluation including cognitive assessment, physical measures, TCD, and medical examination are performed at 6 and 12 months. (i) Health Interview and exam: Demographics, social history and habits, family history, medication inventory, physical activity using the Physical Activity Scale for the Elderly and Instrumental Activities of Daily Living (IADL)  data will be collected. Blood pressure is measured using standardized procedures according to the American Heart Association guidelines[78, 79]: the participant is in the sitting position, rested for 5 minutes, no caffeine or smoking 2 hours prior to measurement, appropriate cuff size (covering 60% of upper arm length and 80% of arm circumference), correct cuff placement (1-2 inches above brachial pulse on bare arm), and use of the bell of the stethoscope or an automatic calibrated blood pressure machine. The systolic blood pressure is defined as the pressure corresponding to the first korotkoff sound (K1) and the diastolic as the pressure corresponding to the last korotkoff sound (K5). Blood pressure is measured in both arms and recorded. The arm with the higher blood pressure is used throughout the study. Two blood pressure readings are performed at each visit and averaged per visit. The physical exam includes gait speed (time to walk 4 meters conducted twice), height, and weight measurements. (ii) Neuropsychological assessment: The battery of tests we chose for both screening and for the outcome measures was selected with the following considerations: brevity, validation in a similar elderly population, and sensitivity to detect impairment change over the study period. The study outcome cognitive tests include Trail Making test (A and B), Hopkins Verbal Learning Test - Revised (HVLT-R), and the Digit Span Test. The Trail Making test requires the connection of sequentially numbered circles (A), and the connection of circles marked by numbers and letters in an alternating sequence (B). This test is considered a benchmark of executive function. We selected this test because it is sensitive to detect frontal lobe pathology in patients with increased cerebrovascular and cardiovascular risk such as those with hypertension[8, 10] The HVLT-R is a 12-item list learning test in which individuals are presented three learning and recall trials followed by a delayed recall and 24 item recognition test. The HVLT-R has been identified as an ideal memory measure for elderly patients, and appropriate reliability and validity have been shown in older individuals We selected this test because it is brief and allows us to identify abnormalities in immediate vs. delayed recognition. The Digit Span Test is a brief task that assesses immediate memory/attention. It is administered using the standard format It consists of a series of digits of increasing length, some of which are recited as presented, and some of which are to be recited in the reversed order We selected this test since it can detect abnormalities with encoding. (iii) Cerebral Blood Flow and its regulation: CBF autoregulation and cerebral vasoreactivity are assessed by TCD using standard procedures described previously Blood flow velocity, and hence CBF, is measured at the middle cerebral artery, which has a high correlation coefficient (0.995) with invasive blood flow measurements and high reliability in elderly subjects . Beat to beat heart rate and blood pressure are also measured by the Finapress system and EKG The Sit-to-Stand is used to assess autoregulation by measuring continuous CBF, blood pressure and heart rate in response to postural changes in sitting and standing positions. Vasoreactivity is measured by asking participants to deeply breath air with 8% CO2  followed by hyperventilation. CBF, blood pressure, and heart rate are continuously measured during hyper and hypocapnea. The change in CBF relative to the change in mean arterial pressure between sitting and standing is used to measure autoregulation. The slope of the relation between cerebrovascular conductance (mean CBF/mean arterial blood pressure) for each R-R interval and end-tidal CO2 is used to assess CO2 vasoreactivity . (iv) Biochemical measurement is done to monitor for adverse events: hyperkalemia and renal failure. RAS activity is assessed using plasma renin activity and aldosterone levels Plasma aldosterone is measured by a radioimmunometric assay (RIA). The Coat-A-Count procedure is a solid phase radioimmunoassay, based on aldosterone specific antibody immobilized to the wall of the polypropylene tube. 125I-labelled aldosterone competes for a fixed time with aldosterone in the patient sample for antibody sites. The sensitivity of this method is 16 pg/mL and the precision is 4-10%. Plasma renin activity is measured by competitive binding radioimmunoassay (RIA) using the GammaCoat plasma renin activity RIA kit. The determination involves an initial incubation of plasma to generate angiotensin I, followed by quantification of angiotensin I by RIA. This technique is highly sensitive to low levels of 0.01 ng/mL/hour and is precise to activity that is less than 10% In addition, a blood sample is drawn for storage and DNA extraction for future genetic studies. (v) Adverse events (AE): We are screening for potential adverse events through self-report by the participant or the next of kin. These include: dizziness, vertigo, light-headedness, weakness, swollen lip or tongue or both, hospitalizations, cough, falls, angioedema, renal insufficiency, and hyperkalemia with ACEI and ARB. Hypokalemia may occur with HCTZ (potassium will be supplemented). The incidence of cough with ACEI varies but 5% is the most commonly reported rate . Angioedema is extremely rare and occurs in about 0.68% of patients treated with ACEI . Screening for adverse events occurs monthly by phone and during each visit where measurements of serum potassium and creatinine are performed. Emergency contact is also provided in case adverse events occur in-between visits or communications with the study personnel. All analyses will follow the intention-to-treat principle. We will use Mixed Models since we have correlated repeat observations and this procedure is not significantly affected by missing data[94, 95] We will compare the change in the cognitive or CBF outcomes from baseline to 12 months between the three groups. The primary independent variable is group assignment (candesartan, lisinopril, or hydrochlorothiazide). A sample size of 100 will allow us to successfully complete at least 90 (10% drop out, 30 per group) participants. 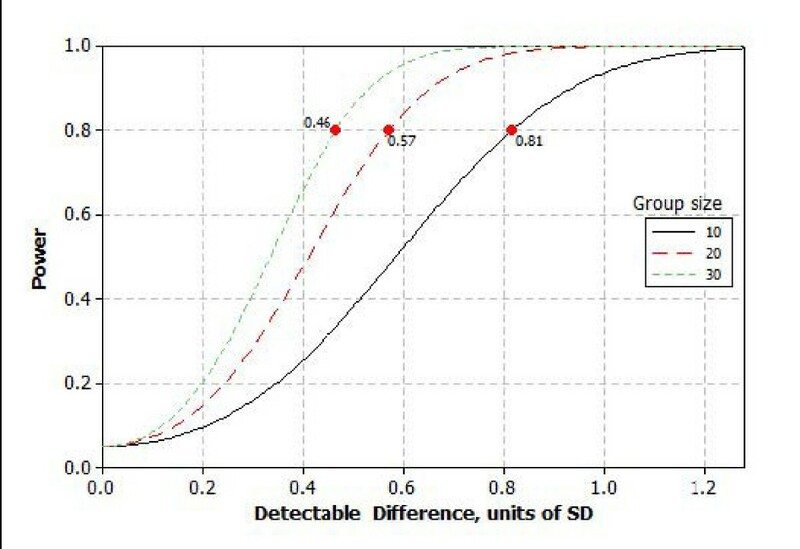 A 30 per group (90 total sample size) allows us to detect at least between group differences in the change (from baseline to 12 months) of 0.46 standard deviation units (α = 0.05; power 80%). Figure 2 provides results of power analysis for the detectable difference, sample size and power. Analysis for the safety of the intervention will be conducted by comparing the number of adverse events (cough, angioedema, leukopinea, increase in serum creatinine by more than 1 mg/dl, hyperkalemia (> = 5.5 meq/dl), hypotension (SBP < 100), dizziness, falls and hospitalization) and the number of participants who withdrew from the study in the three groups using Analysis of Variance (ANOVA). Aging of the population will lead to increase prevalence of hypertension and cognitive difficulties. To date, there are no available data to provide guidelines for treatment of hypertension in those with cognitive impairment. The AVEC trial is the first study to explore impact of antihypertensives in those who are showing early evidence of cognitive difficulties that have not reached the threshold of dementia. Observational studies have been conflicting and some suggest that treatment of hypertension may have a negative effect on cognitive function [96–98]. Therefore, a carefully performed clinical trial that selects the appropriate population to study is critical to answer the question about the impact of antihypertensives on cognitive function. The role of the RAS in aging is important because of the available therapeutic intervention for this system. Recently, RAS is a critical system in vascular biology and recently in neuroscience. Identifying an impact of ACEI or ARB on cognitive or cerebrovascular function will provide additional mechanistic and therapeutic evidence of the role of RAS in aging. Dr. Hajjar and the AVEC trial are supported by grant 1 K23 AG030057 from the National Institute on Aging. IH, LL and WM were involved in developing the basic idea for the study. VN was further involved in developing the idea and the transcranial Doppler and antihypertensive taper protocols. IH and MH are responsible for the data collection. All authors contributed to the final manuscript by reading and correcting draft versions.